Daily Deals Coupons are a bit different than other Maui coupons. They come and go very quickly and are more specific, usually targeting a local area. Many love them, but some just don't. The good thing is they are free and the discounts can be very interesting (up to 90%!). But the challenge is to find the right coupon at the right time. Note that daily coupons are currently available mostly in the Honolulu area. Demand being on a quick rise, my guess is local Maui offers should be available pretty soon. My recommendation is to give daily coupons a try. There's nothing to loose here. But to really take advantage of the system, I strongly suggest that you subscribe to the email service (provided for free by each company). Instead of spending time each morning checking for new Hawaii Maui coupons, the latest deal-of-the-day is automatically sent straight to your mailbox. Much more useful. Click on the logo to access the Groupon website. Make sure to choose Honolulu as the location to get appropriate local daily deals. See Honolulu daily coupon example on the right. Don't forget to subscribe to the email service to receive daily coupons in your mailbox. Tip - You can also check for your hometown deals while you are there. You may find a good local deal. 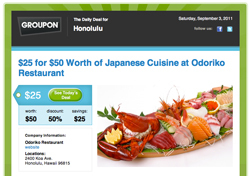 To make things even easier, I added a banner below displaying today's Groupon Honolulu coupon. Click on it to see more details. Remember to come back often since the deal changes every day. Living Social is another popular Daily Coupon provider. 50% to 75% savings are not rare here, but once again you need to find the right deal for your needs. What makes Living Social special compared to its competitors, is a very unique sharing system. Each time you buy a coupon, you get a special link that you can share with friends and family. If three persons buy the coupon from you, yours is free! This can be pretty interesting if you are traveling with family, another couple or a small group. To see today's special deal, visit the Living Social website. On the homepage, select Honolulu as your location (if not already selected). As for other daily coupon providers, I strongly suggest that you subscribe to the email service in order to receive the latest deals in your mailbox. It's a time saver. Your Best Deals Coupons offers daily coupons just like Groupon and Living Social do. Once on Your Best Deals' website, set Honolulu as your location or choose National for a wider range of coupons. You can also choose to browse all deals by location or category. This feature can be useful to look for travel or activity coupons. Make sure to subscribe to the email delivery service. BuyWithMe does not cover Hawaii yet. Instead, watch for National deals (using the All Deals tab) and Destinations Deals as well. Don't forget to sign in to receive daily coupons straight to your mailbox. In the meantime, you can still get local coupons for your hometown and save extra money for you next Maui Hawaii vacations.